Faversham Literary Festival presents award winning and published poets and storytellers at The Guildhall at Faversham on February 16th, Saturday at 7.30. Arrive at 7.15. These events are popular,exciting and stimulating with something to suit all tastes. This is a free event with free fizz and wine and hosted by the effervescent Angel Cakes Dye. 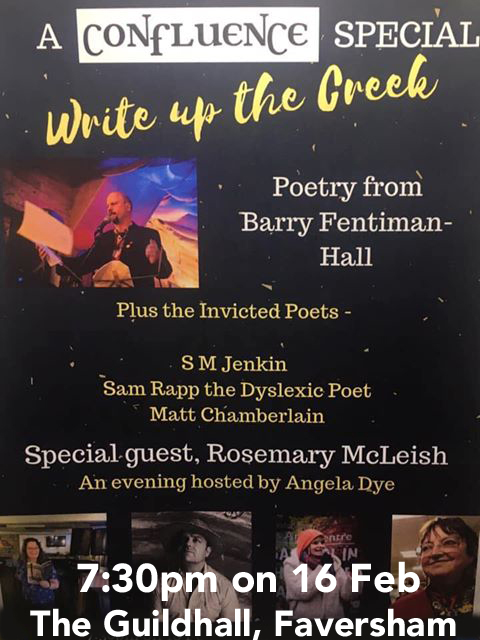 All four Invicted poets are performing together which is quite rare so definitely catch them at this. Headliner Barry Fentiman Hall is a stunning poet who commands the stage and the room.